Have an Easter break with a difference. 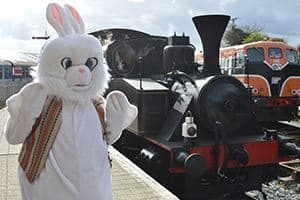 Take the train from Downpatrick to Inch Abbey, take part in a word hunt, get your face painted and meet the Easter Bunny. All children get a chocolate egg. Read more about the Easter Eggspress here. If you’re at a loose end on a Bank Holiday Monday, then a visit to our heritage railway is the perfect way to pass the afternoon. 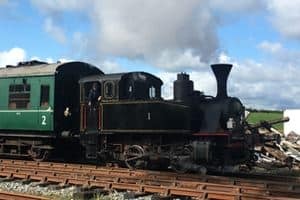 Sunday steam trains running for the early part of summer. Saturdays and Sundays from 20th July to 8th September. Enjoy a nostalgic trip into the past each Saturday and Sunday through the summer. As well as your train ride and visit to our other attractions, you can walk to Inch Abbey and on special event days you can meet the monk who guards the legacy of the abbey. European Heritage Open Days run at the end of summer – more details to follow. Train times to be confirmed. Dare you travel out to the Haunted Graveyard where the Ghosts rise from the dead? 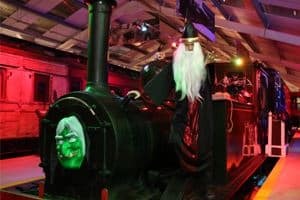 And meet Merlin the Wizard on board his haunted Ghost Train! Children receive a present, if they can get past the Ghosts… Merlin likes the kids (and the parents) to be dressed up as scarily as they can! Visit our Halloween page here. 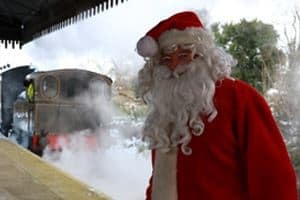 Meet Santa Claus on board his steam train and have a one-to-one meeting with him. Children’s entry is dependent on being good throughout the year. Tickets will go on sale during the summer! Sign up to our mailing list here, and we’ll let you know as soon as tickets are available. Visit our Lapland Express page here. 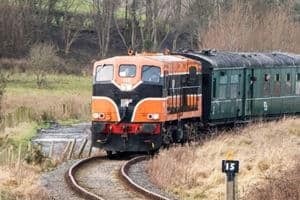 Relax after the hubbub of Christmas and New Year with a Mince Pie and journey through the County Down countryside on a train hauled by a heritage diesel locomotive. A great day out for the family, and also a highlight for any diesel fans out there. Trains run to our standard timetable and standard fares are charged.